CEDAR RAPIDS — Life along the river in Cedar Rapids could return to normal in the next few days, depending on how fast the Cedar River level drops, city officials say. 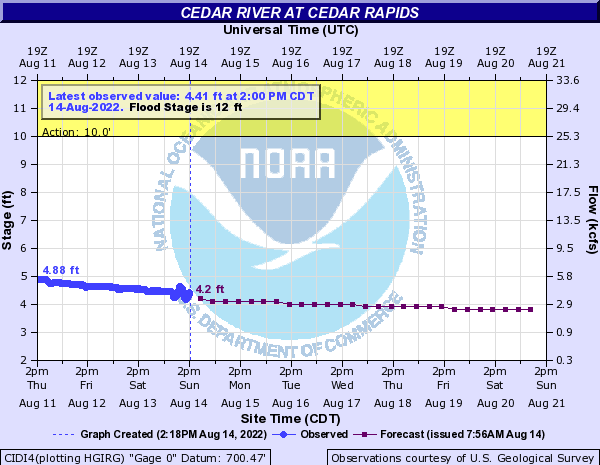 According to the National Weather Service, the river in Cedar Rapids is expected to crest at 18.3 feet — still some feet shy of the 2016 crest of 21.95 feet and several feet short of 2008’s crest of just over 31 feet — by Tuesday morning and then gradually drop. The river is not expected to fall below flood stage until the weekend, however Cedar Rapids Public Works Director Jen Winter said as the water level dips, flooded roads should begin opening back up. “As the water recedes off the roadways, we’ll go check those roadways, make sure they’re safe, and then we would try to get those roads opened back up as quickly as we can,” she said. For a full breakdown of all river levels across Iowa, please click here. Flooding has closed about a dozen city roads, a majority of which are in the southwest quadrant. Over the weekend, the weather service predicted a river crest of 18.6 feet, 3 feet higher than anticipated in the earlier part of last week. In response, city workers on Monday placed a row of sand-filled HESCO barriers in low-lying areas on the west side of the river, according to a city news release. A portion of those barriers, Winter said, were placed along the river near the McGrath Amphitheatre and behind the Cedar Rapids Police Department. City workers also plugged additional storm drains and manholes, closed off the underground storm sewer system to prevent water from backing up and flooding streets or businesses, and stationed additional pumps in the Time Check Neighborhood, Czech Village District and Kingston Village District. So far, the city said, flood protection measures have held, preventing any damage beyond the few road closures. “We’re running 24-hours shifts to make sure that the flood protection measures are holding,” Winter said. “So we have people working around the clock pumping water if needed, making sure our road blocks are staying in place and making sure the measures we have in place continue to hold. Winter said the city watched closely for signs of trouble last week with ice accumulation on Cedar River between Cedar Rapids and Waterloo, however those concerns have since been alleviated. “Late last week, a lot of the ice that we still had on parts of the Cedar River near Cedar Rapids released and flowed down river,” she said. “And there have been some smaller ice packs that have released between Cedar Rapids and Waterloo that we’ve seen come through. For Vinton, however, the weather service has changed the flooding forecast from minor to moderately severe due to “an ice jam upstream of Vinton combined with additional flow coming downstream from Waterloo.” With those factors, the weather service upped the predicted crest to between 18.5 between 19 feet. In Cedar Falls, the Waterloo-Cedar Falls Courier reported ice on the river began to break apart and shove into houses along Cottage Row over the weekend. The river crested at just below 95 feet in Cedar Falls on Monday morning, which is about 6 feet above flood stage, and is now falling, according to the weather service. And in Waterloo, the Cedar River was measured at 18.6 feet Monday morning, which caused minor flooding in the area. According to the weather service, Waterloo could see the river dip below flood stage by late Wednesday evening. In other parts of Northeast Iowa, minor to moderate flood conditions have also been reported. According to the National Weather Service, the Cedar River at Charles City was at minor flood stage near 13 feet Monday and is expected to fall below flood stage Tuesday afternoon. In Tama, the Iowa River was recorded at 13.2 feet Monday, just slightly above flood stage, and is expected to dip flood stage by Wednesday morning. And the Wapsipinicon River at Independence was in minor flood stage at about 13 feet Monday, with ice activity affecting river levels. It is also expected to fall below flood stage Tuesday. In the Iowa City area, south of the Coralville Dam, river levels are far below flood stage and are expected to stay. The Army Corps of Engineers on Friday increased the outflow from the Coralville Lake Reservoir to 10,000 cubic feet per second to accommodate snowmelt upriver, but water is forecast to stay below the spillway crest of 712 feet. On Monday, the levels were just below 700 feet and were projected to crest at just over 707 feet by next week. The record high of 717.02 feet was set during the 2008 flood.